The Urus will enter at the top of the ultraluxury SUV segment. SANT'AGATA BOLOGNESE, Italy -- There's a reason why Lamborghini took almost six years to take the Urus SUV from concept to reality. "With the Urus, Lamborghini is not only entering a segment that is completely new to our brand, we are also doubling the output of our company," CEO Stefano Domenicali told Automotive News Europe. "Each decision needed to be properly pondered." The wait is over. Lamborghini unveiled the production Urus on Monday and will begin sales next spring. Domenicali said earlier this year that the Urus “will be perfect for” Canada. With the Urus in the lineup, he expects total annual Lamborghini Canadian sales to hit “400 by the end of 2019.” Canadians bought 175 Lamborghinis in 2016, up 6.7 per cent from the year prior, according to the Automotive News Data Center in Detroit. The 650-hp, 200,000-plus euro (C$300,000) Urus is poised to enter at the top of the ultraluxury SUV segment, which already includes the 608-hp, 182,000 euro Bentley Bentayga and the 629-hp, 282,000 euro Mercedes-Benz G 65 AMG. Aston Martin, Ferrari and Rolls-Royce plan to join the fast-growing sector in the coming years. Despite the rising number of competitors in the niche, Lamborghini is confident its product, which can top 186 mph, will stand out. “After having driven the Urus, I have no doubts it will be a great success because there is nothing on the market combining this level of performance with a truly luxurious interior,” said Domenicali, a former Ferrari Formula One team boss who joined Lamborghini as CEO in March 2016 after a short stint at the Ingolstadt, Germany, headquarters of the supercar maker’s parent, Audi, which is part of the Volkswagen AG. The Urus’s arrival puts an unprecedented level of pressure on Lamborghini, which plans to build about 1,000 units of the SUV next year then increase the volume to 3,500 annually starting in 2019, with the option to grow up to 4,000 units if demand is higher, Domenicali said. That level of output for one model would exceed Lamborghini’s best-ever production year for the entire brand. Last year, Lamborghini sold a record 3,457 vehicles worldwide, up from 3,245 the year before. The U.S. was its biggest market with 1,041 supercars sold, ahead of Japan with 359 and the UK with 326, according to company data. With just two models in the lineup, the Huracan and Aventador, this year’s sales are on track to be marginally higher than in 2016, Domenicali said. For the Urus, Lamborghini has added its first paint shop in its 54-year history. The company previously relied on external suppliers for the work. “Painting in-house will be crucial for Ad Personam (the company’s personalization program) and the special editions we are planning over the Urus’s life cycle,” said Domenicali, who declined to reveal how much the company invested to launch the Urus and to double the size of its facility in Sant’Agata, Italy, to 525,000 square feet from 262,000 square feet. Lamborghini is also adding 700 people to its 1,050-person workforce. Half of those new employees will work in the paint shop or on final assembly. To complete the Urus, Lamborghini will rely heavily on contributions from VW, which provides the SUV’s steel chassis, aluminum body and twin-turbo, 4.0-litre V-8 engine. After the Urus concept debuted at the Beijing auto show in 2012, Reggiani’s target weight for the production Urus was below 2,000 kg (4,400 pounds) and his power goal was 600hp. The final product weighs a little below 2,200 kg but its power had risen to 650 hp. As a result, the production Urus’s weight-to-power ratio is 3.38 kg per hp, not far from the 3.33 figure that would have resulted from the 2000kg/600hp target. 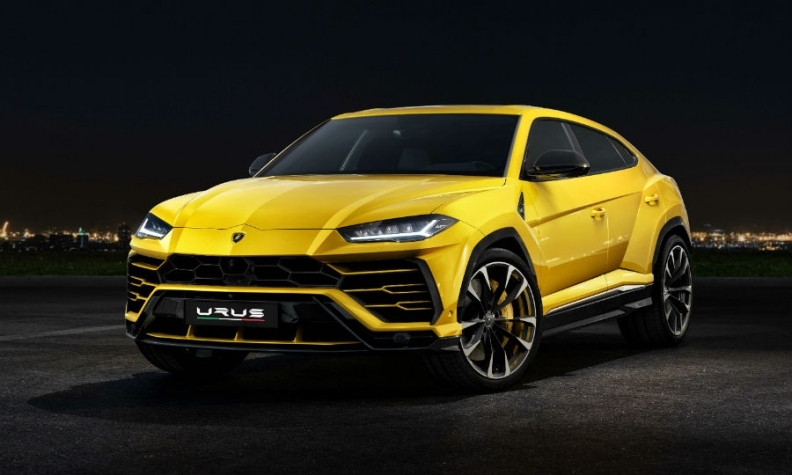 “The Urus will have a top speed of more than 300 km/h -- no other SUV does that,” Reggiani said, adding that what is equally impressive is the size of the carbon ceramic disc brakes Lamborghini has equipped the SUV to make sure it brakes well. Asked what he finds most appealing about the Urus, Reggiani said it is the feeling of safety and maneuverability that the Urus delivers at any speed and on any type of terrain. He said the secret to achieving this was Lamborghini’s aggressive use of rear-wheel steering. While rear-wheel steering is not new, Reggiani said that no other automakers make it available in any driving conditions, thus maximizing its benefits. “The Urus’s wheelbase is 3,003mm (10 feet), but by adjusting the rear wheels by 3 degrees in both directions, the driver obtains the effect of a virtual wheelbase that extends or shortens by 600mm (two feet), thus increasing stability during high-speed cornering and improving maneuverability during slow turns,” Reggiani said. This story is from Automotive News Europe's monthly magazine, which will be available to read on our iPhone and iPad apps.You can also download the new issue as well as past issues by clicking here. To always keep control of body, roll and pitch, the Urus comes standard with active front and rear antiroll bars that are linked to a 48-volt battery system to improve responsiveness. Reggiani says the Urus is also a capable off-road machine that he predicts will quickly become the so-called “King of Hill” on Dubai’s Big One Dune, which is an unofficial testing ground used by many luxury SUV buyers living in the Middle East. While nearly every automaker will tell you that it is targeting younger buyers with its newest model, Lamborghini Chief Commercial Officer Federico Foschini says exactly the opposite of the Urus. “Sixty to 70 per cent of our buyers of super sport cars are under 50. In markets such as the U.S. and China, 40 per cent of the buyers are under 40. But since the Urus will also appeal to a completely different type of buyer, we expect older customers as well as more women,” he said. Foschini considers the Urus to be a super sports car with an SUV’s body. He expects the SUV’s sales by region to break down the same as they do for the rest of the company’s lineup, which would mean one-third each for North America, Asia Pacific and EMEA (Europe, Middle East and Africa). Nevertheless, he expects the SUV to be a big hit in markets such as China, the Middle East and Russia. 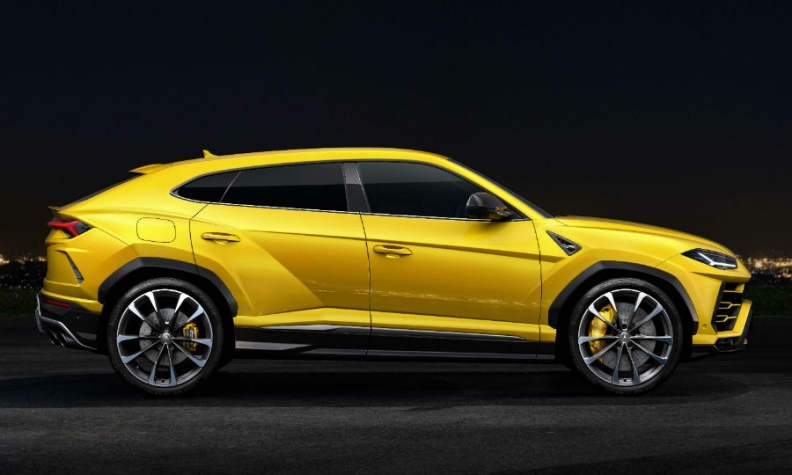 One reason he sees the Urus being a winner in China is because Lamborghini has tailored the SUV’s plug-in hybrid powertrain to that market, meaning it will have a 3.0-liter V-6 to avoid costly taxes and duties applied to vehicles with larger engines. The Urus is equipped with a 3.0-liter engine will cost about $47,000 less than with a 4.0-liter powertrain in China. While Lamborghini is counting on the Urus to quickly double the brand’s sales there are no plans to dramatically increase the company’s global retail network. “We have 136 dealers now, we plan to grow to 150 by 2018 and reach 160 by 2019,” Foschini said. However, Lamborghini wants the size of the dealerships in the network to increase significantly. Foschini said Lamborghini is asking its dealers to increase showroom space by 50 per cent and double their workshop areas. “The Urus will be an everyday vehicle for many buyers. Therefore, they will require more servicing than the super sports cars that are typically used just on the weekend,” Foschini said. The Lamborghini Urus is the spiritual successor to the LM002 double-cab pickup launched in 1986. The expansion that Lamborghini is asking its dealers to undertake includes a complete overhaul of the brand’s corporate identity. The first dealer to use the company’s new logo opened in September 2016 in Bristol, England. The first store to make the overhaul in North America opened in October in Toronto, Canada. Despite a production volume of only 15 units a day, the new assembly hall created for the Urus in Sant’Agata is state of the art. “We have a digitalized assembly line,” Lamborghini Chief Manufacturing Officer Ranieri Niccoli said. “Paper is gone because everything is checked by touchscreens and bar codes.” Even the moving assembly line has disappeared because each Urus is moved by automatically guided vehicles (AGVs) around the factory’s 23 work stations. Two workers at each station complete their tasks in about 35 minutes. Soon, even the so-called “supermarket chariots” used to carry parts to different assembly line stations will be replaced by smaller AGVs, Niccoli says. This digital factory, which Lamborghini refers to as MES, short for manufacturing execution system, uses accounting and management software from SAP. Lamborghini knew that putting such a heavy reliance on software to run its plant was a risk given that it typically takes time to de-bug the system. That is why Lamborghini tested the new system with the Aventador, which accounts for five units a day, before using it for its highest production model. “We are still in pilot production of the Urus, about one unit a day, and so far, MES is operating properly,” Niccoli said. The Urus continues Lamborghini‘s bull-themed naming tradition -- the urus is an ancient ancestor of modern day cattle, also known as aurochs. The Spanish fighting bull, as bred for the past 500 years, is still very close to the Urus in its appearance, according to Lamborghini. The automaker's previous utility vehicle, the 450-hp LM002, was built between 1986 and 1992. The brand sold slightly more than 300 units of the model. The LM002 was a double-cab pickup with an open rear lid. It became an iconic model, particularly in the Middle East. Thirty-one years ago, the LM002 was the first -- and the only -- rugged, high-performance off-roader. 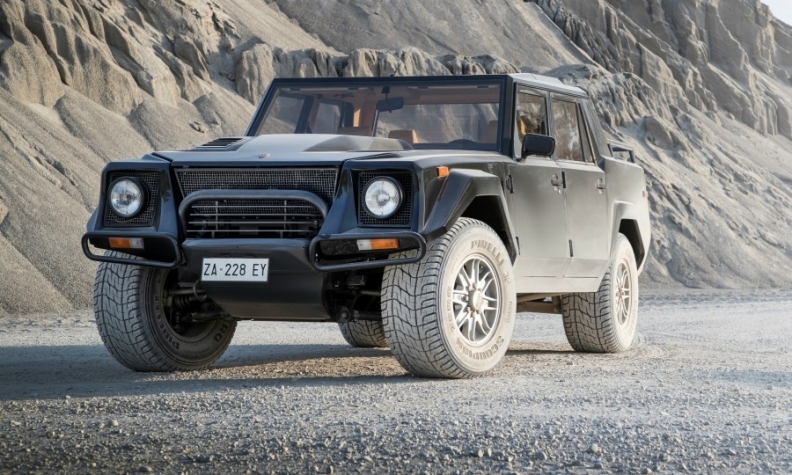 It even had a catchy nickname, the Rambo Lambo, for its rugged, aggressive looks. Today, prices of the LM002 range from 330,000 euros for a 1987 model found in Italy to 395,000 euros ($468,000) for a 1992 model in Germany, according to the autoscout24 website. By comparison, a brand new Urus that offers more power, more luxury and emits far less CO2 might look like a bargain at a starting price that will be more than 100,000 euros ($118,000) less.